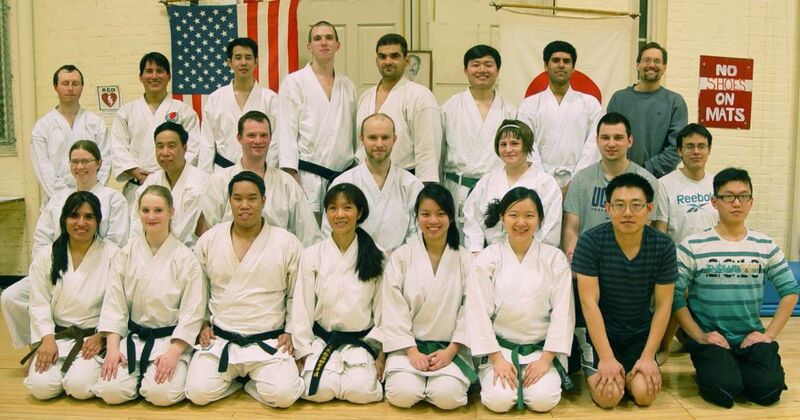 UConn Karate Club class photo, March, 2013. Front row: Keila Garrido, Sarah Boyce, Susie Huang, Lynn Nguyen, ?, Bingchuan Liu, Nguyen Nguyen, Hong Ngo, Yang Yang. Second row: Brianna Boyce, Liam Boyce, Ryan Jacobs, Kenny Peng, Jose Diaz, Kelcie Reid, Jenna Batlas, ?, ?, Edgar Cabrera. Standing: Nick McIntosh, Darwin Jurado, Paul Borochin, Tony Carpanzano, Brian Boyce, Aidan Boyce, Tom Hine, Matt Swircenski, Drew Strileckis, Dian Kai Jiang, Greg Hoffman, ?, ?, Max Partzka, Jimmy Liang, Joan Michael Chacua, Ardheeshan Selvachandran, Brandon Lopez, ?, Daniel Bubniak, Thai Nguyen, ?. Front row: Keila Garrido, Alex Jacobs, Jeremy Bui, Kim Bui, Lynn Nguyen, Athena Tao, Bingchuan Liu, Yang Yang. Second row: Kate Morozova, Chinh Bui, Ryan Jacobs, Mike Jacobs, Nicole Depowski, Greg Hoffman, Edgar Cabrera. Back row standing: Nick McIntosh, Darwin Jurado, Zachary Bui, Joe Dowden,Tony Carpanzano, Sokheang Chay, Kevin Matthews Tharakan, Mark Rollins.